"41HS261, 2003.08.59, Burial 8, Vessel 30" by Timothy K. Perttula and Robert Z. Selden Jr.
DECORATION (INCLUDING MOTIF AND ELEMENTS WHEN APPARENT): The rim has four engraved panels with upper and low rows of small excised triangles. The panels are divided by excised brackets. 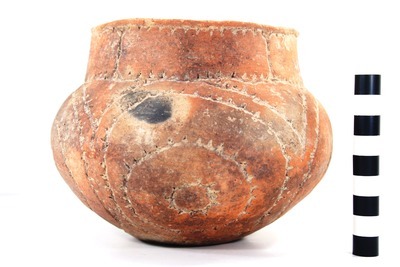 The vessel body has four sets of engraved concentric circles with excised pendant triangles on the engraved lines. TYPE AND VARIETY [IF KNOWN]: Patton Engraved, var. Freeman. Patton Engraved, var. Freeman carinated bowl, Burial 8, Vessel No. 30, J. O. and Henry Brown site.